We were constructing our dream house for a family of four. A total roof off renovation and extension of a 140 square metres, stone-walled Italian farmhouse in the hills near Città di Castello. Heating is a big issue in Italy and having rented a farmhouse for a number of years we knew first-hand how brutal the winters can be! This is how we met that challenge. 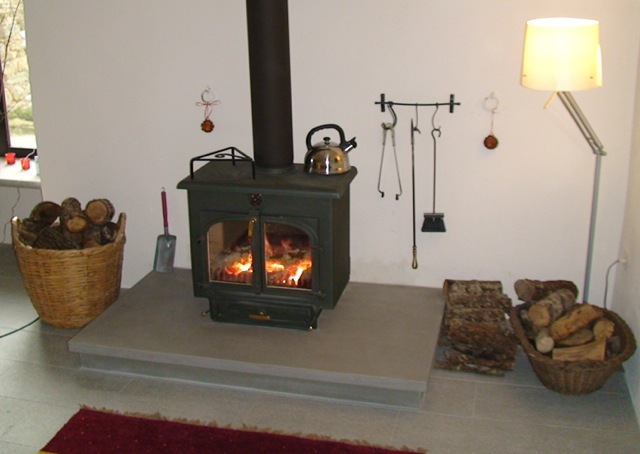 Heating with gas was never an option, a pellet stove offered expensive fuel with noise and maintenance. What we needed was to burn wood (the cheapest source of energy) and add free solar power to that; how to integrate all these things workably and efficiently was not at all clear but fortunately eco-heating consultant Patrick Littlehales stepped in with a total solution which was clearly going to tick all the boxes. After a whole day in a heating seminar all the clouds lifted and the final system was not only obvious but remarkably simple too. Basically it’s a big tank of water (Specflue 500L heat bank) a Clearview 750 stove with back boiler and an extra big set of solar panels. Probably the one thing that brings this off is matching the overlap of the power curves as winter heat (wood) gives way to summer solar – when the curves overlap you don’t need another source like gas to fill in. Patrick is a great exponent of ZERO COST heating and we loved that idea. It was simple enough; photovoltaic solar panels on our new roof would make enough money to pay for wood and minimal electricity. To catch a good tariff Marco Tufi from IWT Engineering put the panels on the old roof and then they were later transferred to the new roof a year later when it was ready. Going into our second winter the system has met all our expectations – we just love it. The 14kW stove is a focal point and is a joy to operate. It easily heats the house (radiators/UHF upstairs and UHF downstairs) and provides masses of hot water. The tank has a 3kW immersion heater and I fitted an additional 2kW one to use some of our free electricity. The oversized solarthermal array has been startlingly successful. Three panels from Sunerg sit on the bank by the house (fantastic bargain – thank you Patrick). They are angled steeply to catch the winter sun and tame the fierce summer sun; the resulting flat and wide power curve gives remarkable performance in the shoulder months, even into January. Living in the countryside brings the risk of being stranded in the snow and power cuts – a potentially deadly combination. Our stove and tank are simply connected with no pumps so we can cook on the top (we do anyway) and keep warm come what may. Not many homes have that level of security. There’s no risk of our heat bank overheating since it thermosiphons perfectly to two upstairs radiators – slowly dumping the heat – an additional, power-free way of heating! Was it hugely expensive? Yes and no. The up-front equipment costs were certainly weighty but offset by the ease and speed with which the heat bank and all its pumps etc. was installed. In this respect it was practically free. The fact is that the investment will be paid back relatively quickly (Photovoltaic the longest in around 7 years) and after that we’ll live almost cost free in our dream house – what’s not to like? A new controller from Mi Casa Verde as Z-Wave gathers pace. Mi Casa Verde have just released their Vera Plus smart home controller for a mere £140. For anyone considering starting a home security system, with the option of a host of home automation features thrown in, this is really good news. Vera Plus lets you easily set up, monitor and control lights, cameras, thermostats, door locks, sensors, alarms, smoke detectors, lawn sprinklers and more from practically any brand. VeraPlus supports 1400+ devices from all major brands and works with many popular devices using Wi-Fi, Z-Wave, ZigBee, or Bluetooth. All this is unified under one single app which runs on any tablet or smart phone. You can buy Vera Plus from http://www.vesternet.com/ and get plenty of advice at the same time. Z-Wave itself is moving on with the release of a third generation of the chip found in every device. This gives better range between devices which in turn extend the range further in a meshed network. Extended range means that security sensors can be placed further out from your house to mark out your first perimeter. I love the idea of having a table lamp give a subtle flash when guests are arriving – it’s not all about the burglars. Multiple functionality is emphasised in the new chip so now if you buy a motion sensor it is likely to measure temperature and light levels too; all useful features when controlling lights or heating. Another example is the Fibaro flood sensor which includes a tilt sensor (so you know if someone moved it), temperature sensor, a siren, a light, a built in Z-wave network range tester. If you leave your house unattended for long periods, you might feel happier if you had popped one of these on the floor. There are now 250 firms making Z-Wave products, so you might start off with a controller and a couple of sensors, just to get the hang of it, but after that adding more features is a never ending journey. I’ve had a couple of enquiries recently so here is the latest quote from the factory for the ever popular 750 flat top with the 7kW back boiler. N.B. When I’m supplying tanks and stoves I always try to round down the prices and they come with loads of free advice too. You might ask why the Clearview is so popular when it is also rather expensive. Well there’s robustness for a start. Folded up quarter inch plate is tough and indeed rather weighty; it takes 4 strong men to move one. Then there’s the clip in – and easily replaceable – stainless back boiler. A leaky, crack prone cast iron stove with integrated boiler might save a few bob now but you might have to buy a couple more during the lifetime service of a Clearview. A cracked stove could ruin your floors and rugs and leave you without heat for weeks. A fate to be avoided at all costs. Personally I prefer the plain looks and the huge glass doors giving a great view of the fire. LED light bulbs – cheaper than cheap! Take a look at http://www.trillion.co.uk and check out a range of LED bulbs starting from £1.50! Now that’s just as cheap as any other type of bulb so there is no reason to hang back. And yes you should bin any other bulbs immediately in favour of LEDs which consume about a tenth as much as an incandescent bulb. An old 60 Watt bulb running 2,000 hrs a year (if it lasts) will cost £26 to run in Italy and £14 in the UK so the cost of the bulbs is becoming trivial compared to the running costs. I’ve just bought a shed load of bulbs from Trillion and they seem fine with the warm white ones (2,700K) a good colour. Do you make the early morning tea? Don’t you hate standing around in the cold waiting for the kettle to boil? £4 at Amazon for a square timer plug will change your life. Last thing at night, fill up the kettle and leave it turned on. Set the timer to come on when you wake up and only get out of bed when you hear the kettle click off. Nice. If you’d like to talk about heating, cheap pool pumping, solar panels, stoves, tanks and everything else please use the contact form here. A word before you go. No doubt you are either building a new house or updating an old one and looking for the latest ideas on modern heating. To a large degree you are entering a world where many ideas are completely out of date and will lead you to a outmoded system. Your house deserves the latest and best ideas so please read on. 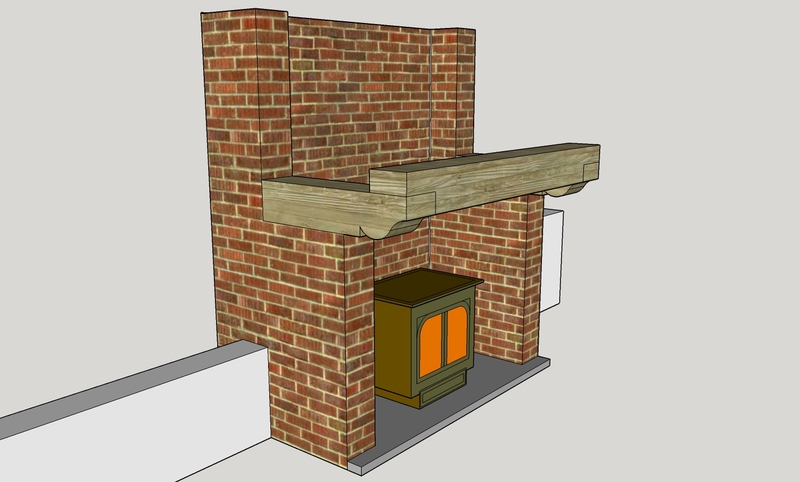 As a designer of many systems using heat banks to integrate wood, solar, gas and heat pumps I might be able to help you. After many installations a set of matched components that work harmoniously has emerged. That is to say, the best heat bank in Europe from Specflue and the best stove, the Clearview 750, both of which I can supply and check suitability with you. 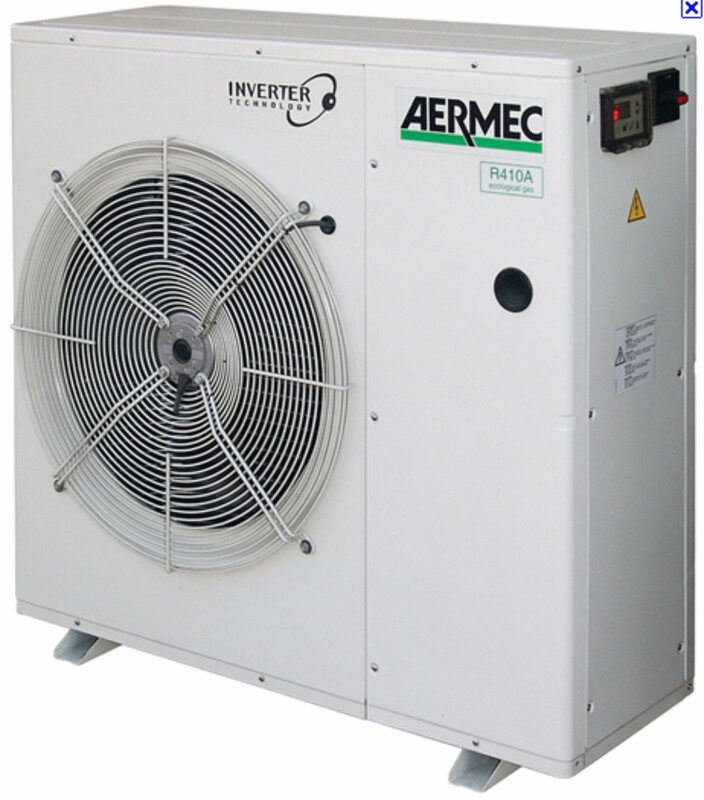 Of course the heat pump in its many guises will help to alleviate the world’s energy problems and it is likely to be at least part of your strategy too. Just be aware that the implementation is often naive and the industry, in my opinion, is not totally up to speed. We on the other hand can have a useful discussion on virtual stratified twin tank systems that solve all the problems that invariably crop up. By the way; eco-heating is usually much simpler and cheaper than you would imagine and very suitable for DIY, just make sure to get the best advice before you start. If you are interested in an unbiased heating survey or in attending a heating seminar near W.Sussex please use the contact form to get your e-mail on my list or drop me a line for a chat. A great day out with lunch and a chat about your projects from 9am to 4pm. €90. For delegates flying in the nearest airport is Perugia and accommodation can be arranged. 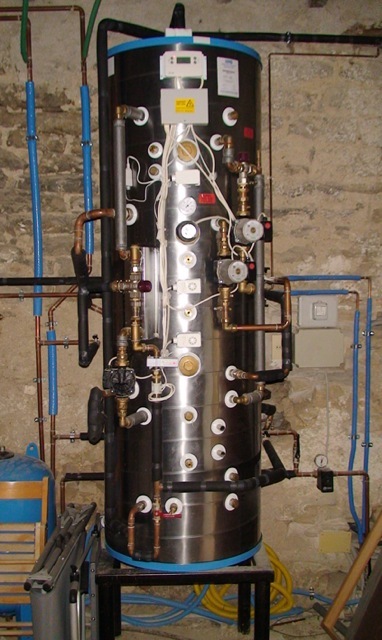 There are many of these fitted in Umbria now and they all work a treat. This stainless steel Xcel heat bank from Specflue (they took over DPS) is still the easiest way to install a turnkey heating system that will run straight out of the box and integrate all your heat sources. The specification has been refined over the years and is now known as ‘The Italian Job’. All the pumps and controls are fitted and wired leaving just a days work to connect a few pipes. There is so much time and labour saved that this could be not just your best option but also the least expensive one too. Extra large 1” ports for gravity circulating stove. 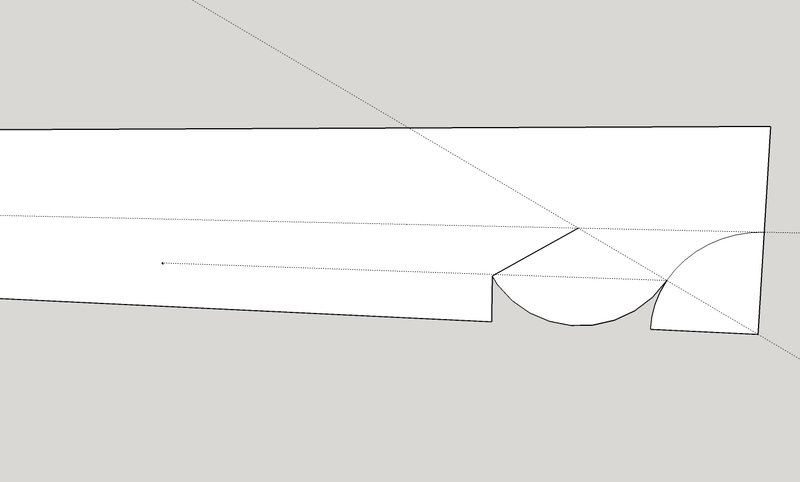 Solar coil with sensor pocket. You might notice some upgrades over the previous Italian Job. The tank is bigger and the pumps are the much more expensive A rated ones. The plate heat exchanger has been down graded to 35l/min. This is like 2+ combi boilers running at once but with less tank depletion than the previous 45l/min version. The latter is still available if needed. Including gloves, temperature guage, colour of choice and UK delivery to the shippers. Free delivery to Italy with a tank order.This lovely stove has been so successful in many installations that I’d countenance nothing less. For most houses this will provide heating, hot water and even cooking without any additional heat sources. The best thing with this stove is the stainless clip-in back boiler which can easily be replaced if needs be. A stove with an integrated cast iron boiler usually means the whole stove has to be replaced – penny wise pound foolish! A fascinating exercise every time. Give me a stack of your last electricity bills and I’ll crunch the data into a table and graph to reveal all the interesting details along with some ideas for money saving changes. Your background consumption will be compared with the norm to show whether those bills are reasonable (as if) and that you are being charged fairly. An explanation of the Enel bill is part of the survey pack. Surveys from €50. Report in print or pdf. A selection of ‘heating News’ back issues can be found at the bottom of the blogs list to your right. The Heatingitaly web site has been superseded by http://www.originaltwist.com which gives more scope to discuss all sorts of interesting topics and to make the heating side less country specific. The old site had a few useful spreadsheets for calculating various things to do with solar and heating in general. I can still send them out on request. This is a market place for anything you want to sell not just heating related items.